About "Angle pairs and one step equations"
Vertical angles are the opposite angles formed by two intersecting lines. Vertical angles are congruent because the angles have the same measure. Adjacent angles are pairs of angles that share a vertex and one side but do not overlap. Complementary angles are two angles whose measures have a sum of 90°. Supplementary angles are two angles whose measures have a sum of 180°. We discovered in the Explore Activity that adjacent angles formed by two intersecting lines are supplementary. Look at the diagram given below and answer the question. Vertical angles are opposite angles formed by intersecting lines. <AFB and <DFE are vertical angles. Adjacent angles share a vertex and a side but do not overlap. 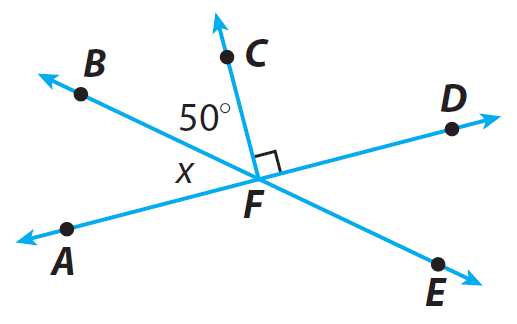 <AFB and <BFD are adjacent angles. Adjacent angles formed by intersecting lines are supplementary. <AFB and <BFD are supplementary angles. Any angle that forms a line with <DFE is a supplementary angle to <DFE. <DFE and <EFA are supplementary angles, as are <DFE and <DFB. Use the fact that <AFB and <BFD in the diagram are supplementary angles to find m<AFB. Subtract 140° from both sides. 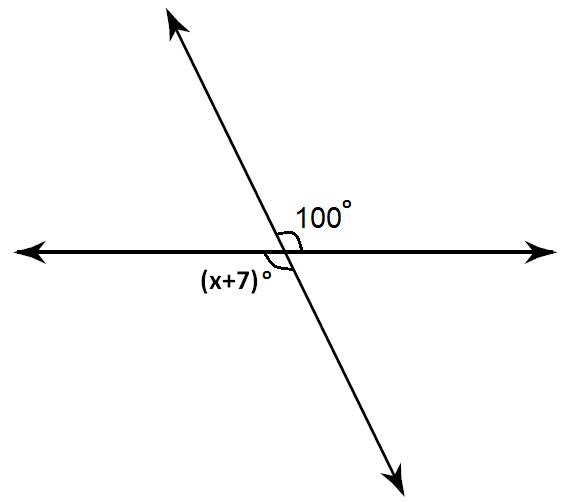 From the picture above, it is very clear (x+7)° and 100° are vertical angles and also they are congruent. Hence the value of "x" is 93. After having gone through the stuff given above, we hope that the students would have understood "One step equations on angle pairs".